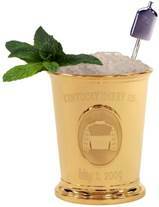 Christened “the most exciting two minutes in sports,” the Kentucky Derby is a heart-stirring, dazzling competition of both power and beauty. A breathtaking show of man and animal working as one. Three-year-old thoroughbreds thunder at magnificent speed in this “Run for the Roses,” held every year since 1875. Founded by Col. Meriweather Lewis Clark, Jr., (grandson of William Clark, of the Lewis and Clark expedition) the race was successful from its inception, with an opening crowd of 10,000 spectators. The event experienced highs and lows until a syndicate of supporters set it on a firm foundation in the 1900’s, and it’s been a tribute masterful horsemanship ever since. This trinity of equestrian trials offered the largest purse (winnings). It was thought to be impossible for a single horse to ever win all three. To this day, through 138 years of racing, only 11 horses hold that honor. 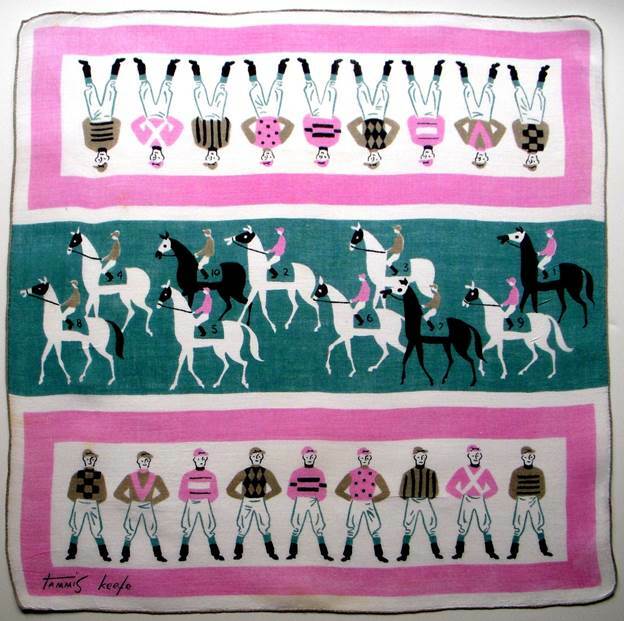 Artist Tammis Keefe’s bright and colorful interpretation of jockey silks in olive, turquoise and pink is joyful and celebratory, putting one in the mood for a day at the races. 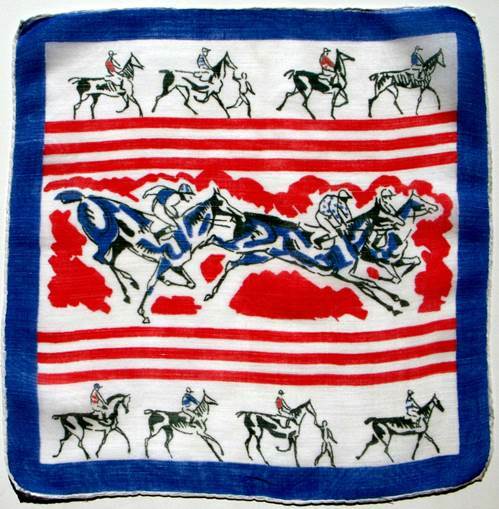 What gal wouldn’t be happy to wave this hankie high as her steed rushes by? The tangle of limbs and pounding hooves keep the borders fast and exciting, while a minimalist layout of jerseys and caps set against tranquil blue-green calm the frenzy. 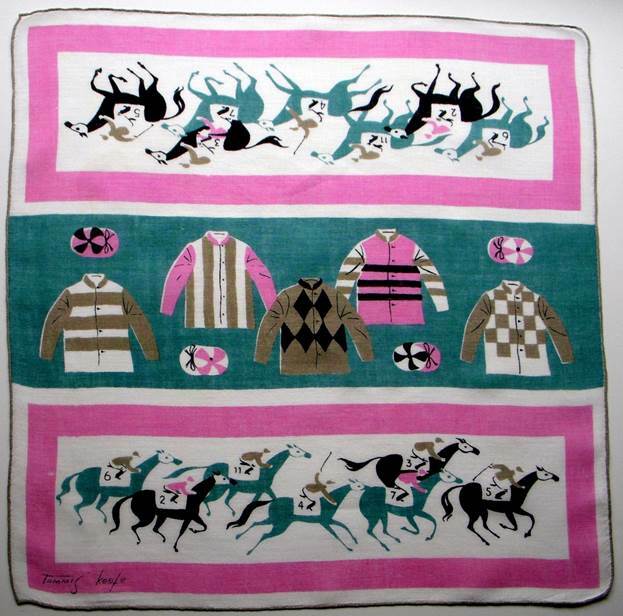 This Celine silk hankie in heliotrope and lime sports various tack surrounding a prancing steed in the center. 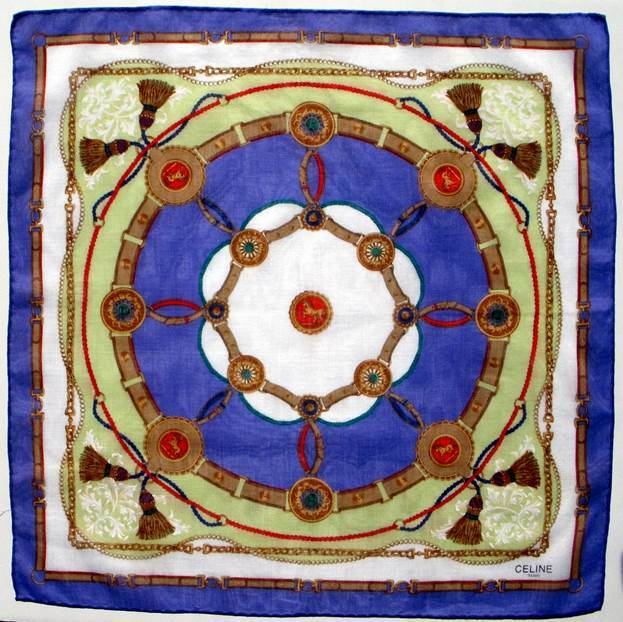 Bold yet elegant, it’s the perfect accessory to wear in the Winner’s Circle. This year’s Derby did not disappoint. 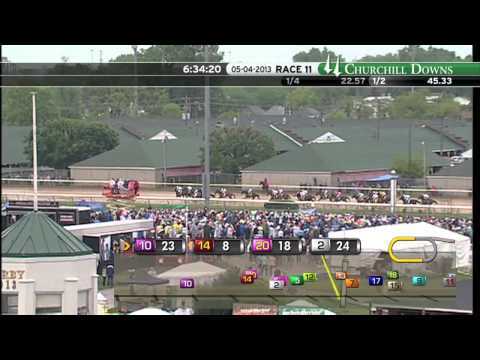 A true cliffhanger, Orb was 16th out of 19 horses for the first half of the race. What horse and rider accomplished was nothing short of astounding, and provided the perfect climax to a world class competition. If you missed it, here’s your chance to see a true thoroughbred capture his well-earned title. 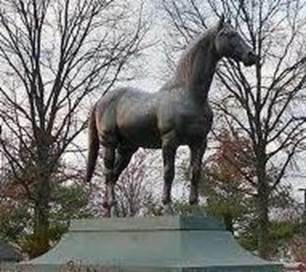 The fastest time ever run in the Derby (at its present distance of 1.25 miles) was set in 1973 by Secretariat, completing the course in just under two minutes. Four decades later, his astounding record still stands. the earth sings when he touches it. Whether you’re a horse lover, or completely new to the equine world, I hope you can spare a few moments to watch history in the making as the magnificent, dazzling Secretariat wins the Triple Crown. From his owner and trainers, to actors Diane Lane and John Malkovich who starred in the movie Secretariat – everyone connected to the steed, either personally or via his legend, came to love him. Watching him in action, you can see he was born to race. I’ve also included a poignant clip of his last days before he died. Keep your eyes peeled for a very brief image in the second video showing Secretariat’s name on a brass plate in his stall. But what’s engraved on the other plaques in the background? His lineage, his champion blood line, naming each sire, dam, grandsire, granddam, etc. as far back as can be traced. You’ll find these plaques, lovingly polished, on the walls of every champion. In addition to earning a racing purse, stud fees for a champion can run into millions over the life of the horse. The great Man O’ War sired 379 foals in his lifetime, producing 64 stake winners. He’s the only horse I’ve ever seen that has the graves of all his children surrounding his. Just to be buried close to his bloodline was an honor. 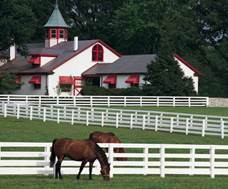 When I lived in Cincinnati, we’d attend the Derby, and during off season, we’d visit the magnificent horse farms. Fences stretched for miles along the rolling hills of blue grass, while beautiful horses grazed in the meadows. It’s another world and definitely one for your bucket list. An acquaintance once told me she thought it was ‘cruel’ the way horses were ‘caged’ and ‘forced’ to run. “Go to Kentucky” I replied,” and you’ll discover animals who love to run, who live to run.” The people who care for them love these animals with all their hearts. 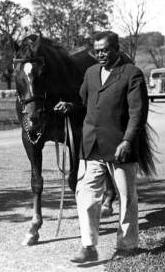 One well known example is the relationship between the magnificent Man O’ War and his gentle, skillful groom of almost twenty years, Will Harbut. The affection between them was so palpable, it was said one could not live without the other. It possibly proved to be true, for when Harbut died after complications from a stroke, Man O’ War died less than a month later. 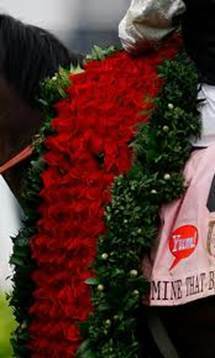 Purportedly, the horse had a heart attack, but many claim he died of a broken heart. Is Kentucky Bluegrass actually blue? Not exactly. A hearty grass that can withstand great cold, it has a dense root system which allows it to grow lush, thick lawns, making it ideal for parks. If not cut, and allowed to grow to its natural height of 2-3 feet, the grass will sprout small blue flowers. An uncut field of Kentucky grass rustling in the wind can indeed resemble a sea of blue.